Drawing on a decade of experience as 3D PDF developers in the industrial engineering and CAD space, Visual Technology Services (the company behind PDF3D software), has observed that 3D PDF is now well used and established within the market. 3D PDF has evolved considerably over the past 10 years and now typically includes extra dynamic annotations, part attributes and labels. 3D PDF documents can also contain full precision for re-purpose and archive, or be stripped-down for review by external clients, making it an invaluable format for collaboration. Published standards are also helping to establish the active 3D PDF ecosystem. 3D PDF has been available for the last 10 years and there are an estimated 2.5 trillion PDF files in the world today. Many PLM and design software vendors now directly integrate 3D PDF generation into design applications, helped along by a variety of 3rd party plugins and converter applications to fill the remaining gaps. US defence suppliers are now obliged to deliver designs under MIL-STD-31000 using 3D PDF, and with large aircraft, automotive, industrial and energy companies using 3D PDF on a daily basis, it’s clearly well established and here to stay. In the beginning, Adobe introduced Acrobat 3D and then Acrobat Pro Extended, by first using U3D technology followed by PRC for generating and editing 3D PDF documents. At that time, the PDF3D-SDK development kit was also introduced to assist application vendors to migrate and support native publishing to 3D PDF, which first incorporated U3D before adding PRC a few years later. After the initial wave of excitement, Adobe removed direct 3D PDF integration from Acrobat, handing over the 3D pathways to external partners and the wider 3rd party 3D PDF vendor community. After a transitional lull, today’s 3rd party community is now vibrant and active with 3D PDF deployed more widely than ever. As one of the early and major players, we enhanced the PDF3D suite to include automated batch production with the PDF3D-XML Server and end-user file conversion tool PDF3D ReportGen to continue pushing the technology and industry further in its functionality. In spite of these market place changes happening on the vendor side, Adobe has continued to support the format allowing all users to be able to view 3D PDFs in the universally available, free Adobe Reader and now, as mobile device viewers emerge on the scene, there are relatively no barriers to viewing 3D PDF documents. To support manufacturing and PLM take-up, the 3D PDF Consortium of developers, systems integrators and users, provides a framework for activities and the promotion of standards, with members, including Adobe and Boeing, with close liaison to ISO, the PDF/Association and NIST. What goes into making a 3D PDF at a technical level involves the PDF document format itself with PRC or U3D data streams containing the 3D model. These parts are described by the standards ISO 32000 (PDF), ISO 24517 (PDF/Engineering), and ISO-14739 (PRC, Product Representation Compact). The archivist point of view is to capture as much of the full model intended by the designer as possible in a neutral format with as few external dependencies as possible. Accordingly, the ISO 24517 (PDF/Engineering) type is intended specifically for the archive and long-term preservation of engineering drawings – both 2D and 3D. 3D PDF has come along way and the benefits are now clear, going much further than simply converting one 3D model into another alternative file type. 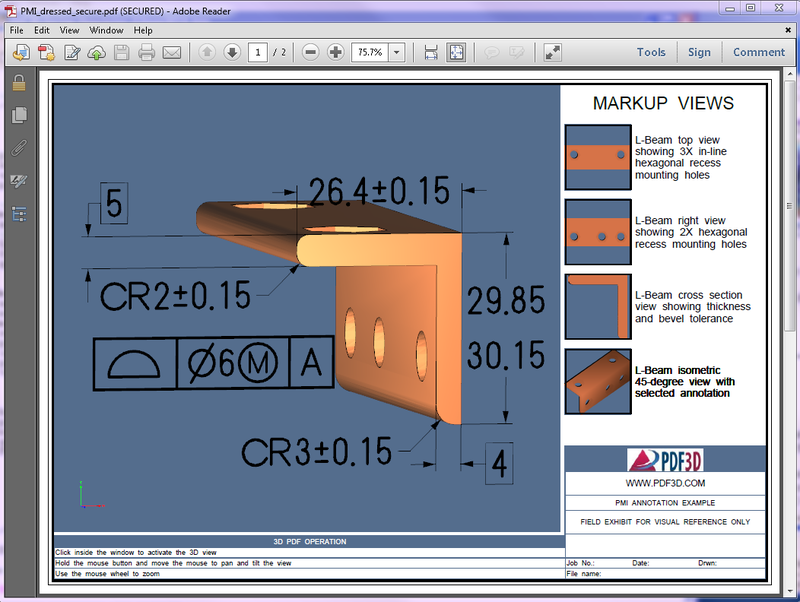 Being able to create and view a fully articulated, segmented assembly in 3D to zoom, rotate, and isolate key parts within a standard PDF file is often compelling enough to provide value to many users, however, this is not just another interactive 3D viewing platform The origins of PDF are as a printable document with precise layout and large document level content support, which means that as 3D is now part of the document, the full description and background information stays in the same file and in context where it is much less likely to get lost. The 3D PDF format includes special modes where amazing level of file compression is possible compared to the original CAD formats. The PDF3D implementation of PRC compressed tessellation mode is often more than 20x smaller than a typical binary STL of the same part, and 10x to 50x for STEP. This enables efficient sharing and storage of files that were originally too large to email or save, without sacrificing detail. Within departments, behind firewalls and between friends where 3D design data access is trusted, the 3D PDF format enables full BREP precise models with PMI and Metadata to be included. Potentially this could also be a vehicle for export and re-use of 3D models, exporting back to a CAD format, or a simplified STL representation when used for 3D Printing or graphic media design workflows. Some workflows are even using the core PRC file format for interchange. For the wary, 3D PDF access can be restricted so that viewers are only able to see what you want them to see for read-only review and comment. For multi-party bids, there is often concern about the security issues surrounding how much of the precious 3D model could be recoverable from a 3D PDF however this can be protected. Only visible surfaces, tessellated representations, accuracy set to a limited tolerance can be specified by using the compressed, tessellated modes of 3D PDF with PRC encoding. The security at full PDF document level using AES-256 bit encryption can further protect design information. From the foundations of very simple 3D PDFs (such as a single U3D file embedded in a blank PDF wrapper), today’s 3D PDFs now often include rich, responsive navigation with added behaviours that connect users to supporting information on demand. This can mean, for example, custom buttons for navigating through views, automatic view cycling to guide users to key areas, camera fly-through, dynamic model animation, mouse-driven metadata reporting and hyperlinks to adjacent sections of the document. With full responsive content, the 3D PDF can also support MBE (Model Based Enterprise) workflows. The basic 3D PDFs of yesterday can even be re-processed to include many of these new features. After 10 years, 3D PDF has firmly rooted itself within the industrial engineering toolbox, used in daily industrial workflows, and backed by solid standards. The 3D PDF file format itself is extremely flexible and can include data representations from many diverse industries. As a neutral document format, it is perfect for collaborating with supply chain partners, vendors, archiving design decisions while avoiding proprietary formats that not everyone has access to. It also provides a light-weight visualization format for original design data protection. Strengthened by new applications such as 3D printing preview and sign-off, the 3D PDF second wave is most certainly here.